The specter of Willy Loman hung over Tom Sparrow as he strode through the Phoenix airport on March 13. Sparrow, on his way home to San Diego, believed more than two months of negotiations on the sale of his Phoenix-area Honda and Hyundai dealerships to AutoNation Inc. had collapsed because of a last minute impasse over real estate leases. Walking to his gate, Sparrow stopped in his tracks as he remembered a scene from a favorite stage play, Death of a Salesman, which chronicles Loman's demise. "Holy smokes, I feel just like Willy Loman here, going home with an empty briefcase: No deals," recalls Sparrow, who owned SanTan Honda and Hyundai of Tempe with partner Bud Thurston. Sparrow and Thurston are just two of the many sellers who have shopped their dealerships this year. Store acquisitions are on the rise as auto sales and dealership profits rebound after the recession. Each transaction is different, but here is the tale of one deal, rocky points and all, reconstructed by interviews with the buyers and sellers. 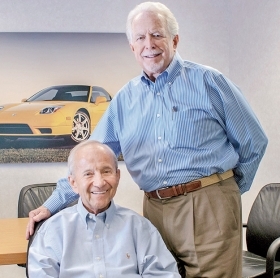 Tom Sparrow and Bud Thurston sold 2 Phoenix dealerships to AutoNation this spring. Earlier that day in Phoenix, AutoNation, the country's largest dealership group, had rejected changes Sparrow had sought in conditions attached to the leases of the stores' real estate. The parties were in the final countdown to the deal close when buyers and sellers work to sort out the dangling details after the big issues supposedly have been resolved. The companies already had surmounted the big hurdle: AutoNation originally had wanted to buy the real estate, as it generally does in acquisitions; Sparrow wanted only to offer a lease, and won the point with a 10-year lease and renewal options covering another 20 years. But Sparrow worried that the conditions AutoNation wanted to impose on the way it could eventually buy the property would handcuff him from looking for alternatives on the open market should he want to pursue that at a later date. The snarl appeared to put the deal in the ditch. The longtime commercial builder and dealer dug in his heels, packed his bags and headed to the airport. But by the next day, the deal, eventually worth $51 million, was back in play. Jon Ferrando, AutoNation's general counsel, called Sparrow that morning from his Fort Lauderdale, Fla., office. Until that 20-minute call, Ferrando hadn't grasped the severity of the impasse. Sparrow's flight home, Ferrando realized, wasn't just a negotiating ploy. The seller was genuinely distressed. "The whole deal was at stake, though I thought we should be able to work through it," Ferrando recalls. Two hours later, Ferrando called Sparrow back with a new proposal that included some requested modifications. "We gave in on a lot of things that were important to us, and I didn't necessarily agree" with Sparrow's view of the implications of the conditions for AutoNation's possible eventual purchase of the land, Ferrando says. "But in talking to him, I just understood how important it was to him. That was the last key point." Sparrow repacked his bags and returned to Phoenix. The next week, the two sides signed the deal. By late May, the sale was final. For Sparrow, 73, and Thurston, 66, the sale of the Honda and Hyundai stores was a step toward retirement. They've been partners since the 1980s, when a mutual friend told Sparrow about the chance to invest in the Honda dealership. They still own Acura, Subaru and Volvo stores, which now operate as Thurston Auto Group. Wanting to slow down and enjoy more time with their families, Sparrow and Thurston had long been thinking about selling some dealerships. Their children weren't interested in taking over the business. The rebound in auto sales, rising dealership profits and renewed demand from buyers made the timing perfect, Thurston, the main operator in the pair's dealerships, wrote in an e-mail. In 2012, the partners got their stores appraised and started working with a broker, Randy Callison of Ozog Automotive Group. They figured out a price and evaluated potential buyers, eventually talking with each of the top 10 dealership groups in the country as well as smaller groups, Sparrow says. But the pairing with AutoNation had been years in the making. Thurston had been meeting with members of AutoNation's acquisition team regularly for the past 10 years. He was referred by dealer friends who had sold their stores to AutoNation and were pleased that AutoNation had done a good job of retaining employees. That was "extremely important to my business partner and me," says Thurston, who had been receiving several calls a week from interested buyers for the past few years. "The last thing we wanted to see was a dismantling of the dealership culture and environment we worked so hard to achieve over the last 40-plus years." In January, Raul Rodriguez, AutoNation's vice president of corporate development, got the word that Sparrow and Thurston were ready to consider selling some stores. Rodriguez and Pete Thiel, director of corporate development, flew to Phoenix. There AutoNation encountered the biggest hurdle to the potential deal. Sparrow and Thurston wanted to retain the stores' real estate to ensure a continued income stream of $360,000 a year for their families. But AutoNation prefers to own its real estate. "One of the things we strive to do is listen to sellers' needs," says Rodriguez, a mergers and acquisitions veteran who spends much of his time flying around the country and meeting with dealers over Starbucks coffee or catfish specials at the local diner. "The real estate here was a very key driver." Despite that disconnect, the parties signed a confidentiality agreement and kept talking. But the sellers were lining up other potential buyers, too. "You have two very attractive franchises, Honda and Hyundai; Phoenix was a very good market, and the stores were excellent stores with great culture, great profitability, great locations, great facilities," broker Callison says. "So it had all the elements that drew a very interested group of buyers." Sparrow and Thurston narrowed the pool down to three: AutoNation, Larry H. Miller Group of Sandy, Utah, and Ken Garff Automotive Group of Salt Lake City. After presenting its offer in early February, AutoNation won out. While being close on pricing was key, the responsiveness of AutoNation's mergers and acquisitions team and the cultural fit between the companies also played an important role, Sparrow says. "We could see that we weren't going to get backed up by these guys." After additional negotiating on price and real estate -- AutoNation upped its offer $2.5 million and agreed to lease instead of buy the real estate, Sparrow says -- the parties signed a letter of intent in early February. Next came due diligence and figuring out the details -- and a sudden shift in how many stores were for sale. Late in the game, as the due diligence period neared its end, Sparrow got "heartburn" over selling the Acura store, which had been part of the deal. Worried that the Volvo and Subaru stores wouldn't give him and Thurston enough to work with in the future, Sparrow told AutoNation about his reluctance. After a couple of days, AutoNation agreed to continue the deal without Acura. Even with the glitches over the lease terms and the Acura store, Ferrando calls the Phoenix deal fairly typical. After all, only one deal gets done for every 15 or 20 acquisition opportunities the retailer studies. But after signing the letter of intent, Sparrow and Thurston did something that was unusual: They gathered employees and told them about the pending deal. Most sellers try to keep deals quiet until final papers are signed. They worry that spooked employees will flee and competing dealers will poach talent. But at the Honda and Hyundai stores, the cat was sneaking out of the bag: Visits from the buyers were raising eyebrows. "In Arizona, nobody walks around in a suit," Sparrow says. Thurston didn't want employees, some of whom had worked for him for 25 years or more, to find out about the pending deal from an outsider. "We did our very best to ensure everyone knew the transition schedule, what AutoNation had to offer as a company, and the process each person would be exposed to," Thurston says, to "mitigate any stress the sale might impose on them and their family members." The moment was bittersweet, but the openness worked. Almost all employees stayed. Through June, more than a month after the sale was final, only four of the two stores' 250 employees had left. These dealers, partners since the 1980s, recently sold 2 of their biggest stores to AutoNation. They still have Acura, Subaru and Volvo stores in Phoenix. After the sale was signed March 20, a two-month integration process began. AutoNation kept the stores' general managers. But there was a lot of work to do in merging dealership systems: payroll, information technology, human resources and the like. Even two months after the close, the parties still had loose ends to tie up, such as locating a scissor jack that went missing and was found at the Subaru store, Sparrow notes. The team targeted completion by late May, when AutoNation CEO Mike Jackson and COO Michael Maroone would be in town to rebrand all of the company's Phoenix stores with the AutoNation name. While there, Jackson and Maroone stood in a chow line at the Honda store, serving up barbecue beef sandwiches and salads to dealership employees. "It was a great moment for everyone," says Sparrow, who says Jon Ferrando and Raul Rodriguez will get the first call when he and Thurston consider selling the Acura, Volvo and Subaru stores. "That was on a Friday. They paid us on Monday."